Torrent101, Torrentq and Bitroll are three malware supported BitTorrent clients which are heavily advertised on BitTorrent sites. They try to lure naive users into downloading these clients wiith catchy phrases like "We use unique technology to increase the download speed of your torrents". We decided to turn the tables around and advertised with malware warnings on their websites. How? Well, we started to run Google Adwords campaigns on the Bitroll, Torrent101 and Torrentq websites. In just four days the ads were shown 20,000 times, the clickthrough rate was impressive, and the ads probably prevented more than one thousand people installing these malware-laden BitTorrent clients. Of course these campaigns were just for “fun”. It was nice to turn their advertising strategy against them, and help some naive BitTorrent users along the way. However, the downside of it all is that they now make money off my ads, which allows them to advertise their crappy BitTorrent clients on other websites, so it’s not really an optimal solution. 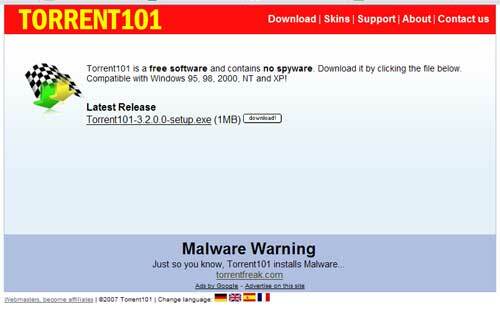 Here’s an example of the TorrentFreak ad on the Torrent101 website. 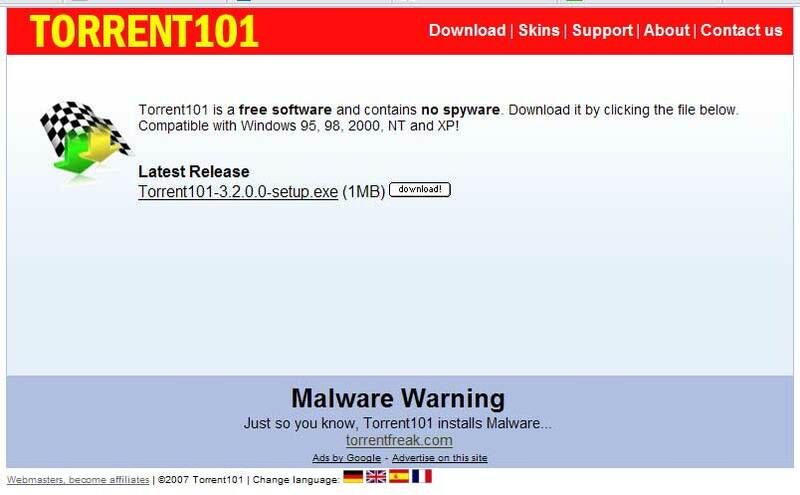 If people clicked the link, they were directed to this post about Torrent101. Luckily, most BitTorrent site admins don’t allow ads for these shady clients on their sites. Brokep from The Pirate Bay said earlier “We’re getting a lot of email about people downloading torrent clients that are advertised on the site. Do not download them! We have put a ban for the ad companies to sell ads for these clients on our site.”, and the admins of mininova and btjunkie also banned all ads for these BitTorrent clients on their websites. People need to be aware that these clients can seriously mess-up up your computer, and the Google adwords campaigns were a fun way to do this. I’m happy to see that Google search is giving a helping hand as well, for free.